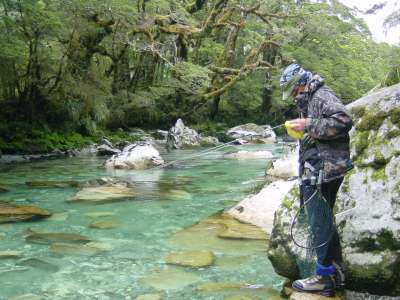 There is no doubt that Sage are one of the world leaders in flyrod technology. I initially chased the hell out of Sage for a number of different reasons. The XP 590 was one of those reasons. A friend once gave me four words: “Because I deserve it”. There's a lot of power in those words and I still haven't fully got my head around them, but I know one thing, flyfishing is what I do and so I make no apologies for wanting the very best in life. And not just for me of course, but for you too. This review may be a little bit different. So it's 520 quid, or 595 bucks depending on which part of the world your living. That's a lot of dough. Most of the cars I've owned cost considerably less. And flyrods destruct. I actually have a talent in this area, and whatever else you may read on the subject, the lifetime guarantee is good for people like me, with a zest for falling down holes and tripping over stuff. I break two rods each year, sometimes more. Mind you I don't actually believe in the lifetime guarantee; I have enough trouble getting to grips with my own. The Sage TCR, although not my choice as the perfect fishing tool, is an amazing rod and massively increased our consistency in last year's distance casting shoot-outs. I get the impression, talking to Marc Bale, that the only time Sage compromise is when it's a strength. 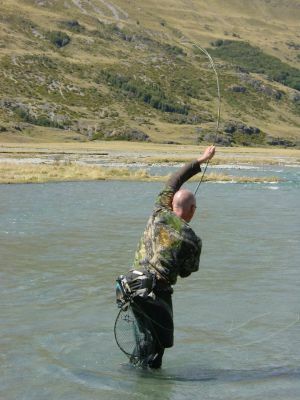 I've spent many years looking for the fly rod most suited to my purposes. Let's define those purposes. I need a rod that I can fish for trout the world over, that packs down into a backpack, that is suitable for demonstrations and gives me pleasure. That means a 9ft 5-weight. I don't like rods longer than this, because I miss out on the pleasure factor. A 5-weight catches me more fish; it allows me to fish finer and smaller. And I can still chuck it a long way – if I couldn't then I'd use a six. 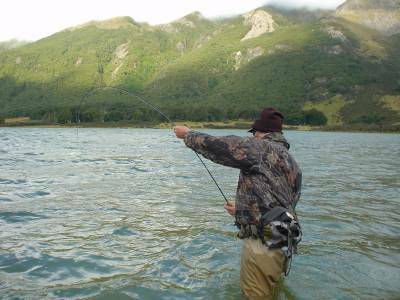 For flyfishing – not just casting – I choose the best casting tool available. I can think of a few other functions of a rod, such as the ability to mend line, play fish and dibble flies, but I don't allow any of these to compromise the casting. If you compromise your casting, you compromise your fishing. The two most important attributes any rod can have are smooth progression and precise tip recovery. Let's face it, we need to be able to cast anywhere from our feet to the horizon, this means a useful flyrod must have a progressive action. Without this it's like riding a one-gear bike through the Alps. A wobbly tip destroys the integrity of the bottom leg of the loop, so this you'll want to avoid too. You can check the progression of any rod by flexing it, and you can check for tip bounce by stopping hard on the backcast and watching the loop. But that's not what you pay for. What you are really gaining is the “feel good factor”. Something almost indefinable – a feeling that only a few truly exception rods can give. These rods have souls of course. See? Told you this would be different. When I cast the XP I become the XP, I'm not trying to compensate or smooth off rough edges. Notice that I didn't even mention fittings, why be superficial? The XP comes in a shiny finish, but I cleverly camouflaged mine with a pot of thin matt varnish.